European Ideas is happy to present this special APCO Worldwide-Euractiv Study that was conducted by Opinion Way. 2012 is a critical year for politics. Twenty countries, including states that have significant influence on the global stage - Russia, the United States, France, Mexico and China - will undergo changes to their governments. In some cases, this may lead to a change in power. Given this unique environment, APCO Worldwide, Euractiv and Opinion Way sought to understand perceptions of foreign opinion leaders about the French presidential campaign. Surprisingly, this question has not emerged much to date, even though France is facing unprecedented international issues in the political and economic field. The APCO Worldwide-Euractiv study conducted by Opinion Way took place from March 21 to 27, 2012, among a sample of foreign business leaders and senior executives (70), embassy officials (56) and foreign press correspondents based in France (56). Those surveyed were asked about their perception of the presidential campaign and of the main candidates. Does the 2012 presidential campaign generate interest? This is a question that, considering the results of the investigation, needs to be qualified. At first sight, the campaign is generally seen as interesting (very interesting for 25 percent of the people surveyed and interesting enough for 47 percent of them). Foreign executives are much more likely than other respondents to find it of little interest (47 percent, against 16 percent for the foreign journalists and 9 percent for embassy officials). Detailed questions, however, reveal that the people surveyed associate rather negative connotations with this campaign (up to 58 percent), with terms like “expected,” “boring,” “monotonous” and “superficial” recurring. We may then interpret this result as follows: the interest in the campaign seems to be more about the way the campaigns are conducted than their content.. The terms “debate,” “confrontation,” “argument,” “fight” (9 percent of respondents) “aggressive,” “violent,” “brutal,” “vulgar” (8 percent of respondents) or “rough,” “polemic, ” “extreme” (8 percent of respondents) are often mentioned, which suggests that French political morals are not - yet at least - seen as very civilized. In absolute terms, the issues considered most important for the presidential campaign are the crisis of the euro (87 percent), reduction of the deficit (86 percent), European integration (85 percent), financial regulation (82 per cent) and immigration (82 percent). These key topics are reflected in their prominence in the campaign. Immigration has been sufficiently addressed for 66 percent of respondents. It is the most discussed topic among these key issues, but perhaps the sample is by nature particularly sensitive to this theme. Fifty-four percent of respondents believe that reduction of the deficit has been sufficiently addressed, 53 percent for the financial reducing, 52 percent for the euro crisis, 49 percent for the European integration - decent scores in absolute terms, but ultimately low in view of the importance given to these issues. The prognosis of those surveyed is unequivocal: the second round of the French presidential election should oppose Nicolas Sarkozy, the outgoing president, and favor François Hollande, the socialist party candidate. The consensus is clear: 82 percent of embassy staff, 93 percent of foreign journalists, and 80 percent of foreign executives agree. 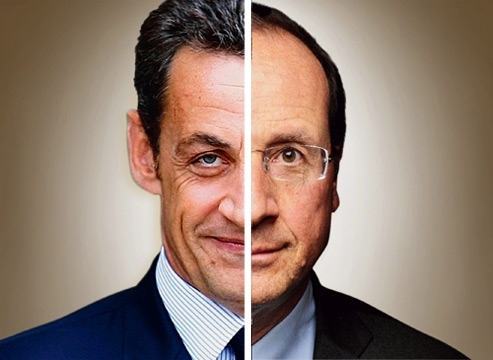 And it is François Hollande who should emerge the winner of this contest for a 52 percent majority of those surveyed, while 46 percent still believe in Nicolas Sarkozy’s chances. With this positioning, the sample seems sensitive to change dynamics. A sizeable nuance is noteworthy, however: foreign journalists are, in the majority (52 percent) and in contrast to the other groups, of the opinion that Nicolas Sarkozy can still win. Would François Hollande’s victory evoke positive perceptions? The result is qualified, as the respondents believe Nicolas Sarkozy is, on the whole, the most skilled candidate to face the major issues raised by this presidential campaign. Compared to Hollande, Nicolas Sarkozy is viewed favorably on international issues such as the crisis in Syria (58 percent positive against 30 percent for the socialist candidate); the euro crisis ( 56 percent against 28 percent); tensions over Iran (55 percent against 30 percent); the Franco-German relationship (53 percent against 31 percent); France’s competitiveness and attractiveness (52 percent against 33 percent); the role of France in the world (48 percent against 35 percent); European integration (46 percent against 35 percent); financial regulation (46 percent against 38 percent). We can observe here an “experience bonus” for the outgoing president, who has been confronted, during his tenure, with a severe economic crisis and several key geostrategic issues such as the war in Georgia, Tunisia, Libya and the Arab Spring, Afghanistan and the Ivory Coast crisis. Perceptions by type of population reveal some complementary differences. Therefore, Hollande appears more competent for managing issues linked to the European integration according to a majority of foreign journalists (48 percent favorable opinions to 39 percent for Nicolas Sarkozy) and issues linked to financial regulation for a majority of embassy staff (53 percent in favor versus 45 percent for Nicolas Sarkozy). The socialist candidate without doubt benefits from his personal commitment on both these topics. France, look at the world! To conclude, all the respondents regret that France is still too self-centered. They insist that the first measures taken by the new president should be to open the country more to the world and in its relations with foreign partners. There are many options to explore to convince all these foreigners who are also “a part of France”: a conference of the foreign ambassadors in Paris; a road show in these 19 other countries that will experience a major vote this year,; a state secretariat in charge of considering a new system of global governance.